Of Courts And Confusion: The Reaction To President Donald Trump's Immigration Freeze, Refugee Ban : The Two-Way A federal judge has issued a stay giving some detainees at airports a temporary reprieve. But chaos has roiled U.S. airports, and family members and foreign leaders are trying to respond to the order. 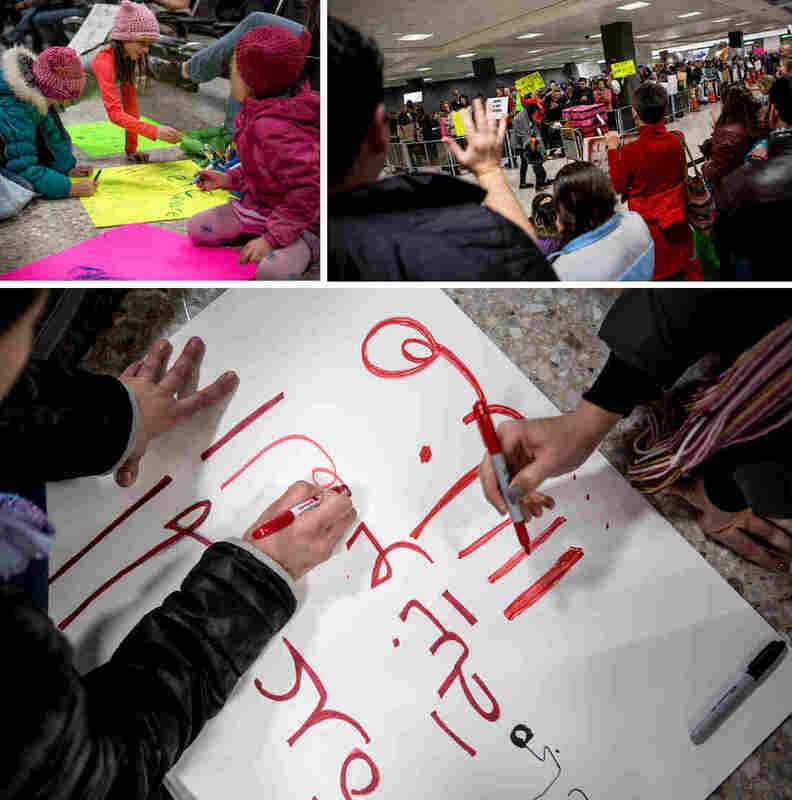 Demonstrators at Dallas-Fort Worth International Airport gather on Saturday to protest President Trump's executive order temporarily barred refugees and citizens of seven countries. That order — which temporarily bars citizens from seven largely Muslim countries, as well as all refugees, from entering the U.S. — was blocked in part by a federal judge in Brooklyn on Saturday night. Addressing a lawsuit brought by two Iraqi men detained Saturday in New York, Judge Ann Donnelly issued a stay that would temporarily prevent federal agents from deporting anyone who entered the U.S. with a valid visa. Three additional federal district courts have issued orders of more limited scope pertaining to President Trump's executive order on immigration. Trump, for his part, issued a statement Sunday defending his executive order. "America is a proud nation of immigrants and we will continue to show compassion to those fleeing oppression, but we will do so while protecting our own citizens and border," Trump said in his statement. "The seven countries named in the Executive Order are the same countries previously identified by the Obama administration as sources of terror. To be clear, this is not a Muslim ban, as the media is falsely reporting. This is not about religion - this is about terror and keeping our country safe." It should be noted that the executive order signed Friday tells officials to "prioritize" people suffering from religious-based persecution — provided that those people are members of a "minority religion" in the majority-Muslim countries covered under the ban. In many of those countries, Christianity is the main minority religion. 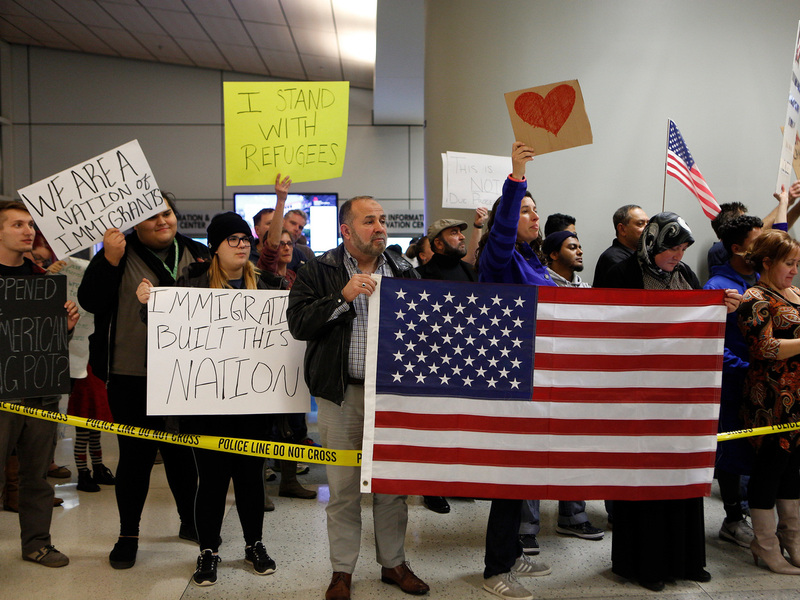 Meanwhile at major international airports, both across the U.S. and around the world, Trump's defense and the judge's ruling did little to ease the maelstrom of protests, outraged politicians and lawyers scrambling to offer legal help to refugees who had been blocked or detained. From the detainees to the protests, from the administration's defense to questions of what happens next — here is what we know Sunday. People at the international arrival terminal at San Francisco International Airport protest President Trump's executive order on immigration on Saturday. Trump's executive order bars citizens from Iran, Iraq, Syria, Yemen, Libya, Somalia and Sudan. That includes those who hold green cards as legal permanent residents of the U.S.; to enter the country, they will need a case-by-case waiver, which officials say will be granted as long as there is no evidence of the person presenting "a serious threat to public safety and welfare." That last detail came as a surprise to Hessam Noorian and his wife, who were detained for more than five hours with their 6-month-old son at Chicago's O'hare Airport. She is a citizen; he has a green card. They had been returning from a trip to Iran when they heard President Trump might ban travel by refugees, the couple told NPR's David Schaper. "But I didn't know this applied to green card. I thought as long as you have green card, then you're are safe, you are fine," she said. After they had been questioned and searched by authorities, they were released. Others, like a traveler from Iraq who spoke with NPR's Jeff Brady, remain less certain. His wife said he was detained at Philadelphia International Airport. A half-day later, as she spoke with Jeff, she had still not been able to reach him to learn what had happened. At the same airport, federal authorities deported two families from Syria despite legal paperwork to enter the U.S.
On Sunday, Philadelphia Mayor Jim Kenney announced that the rest of the passengers detained Saturday would be released, and that "all new passengers arriving today will be treated the same as they would have been prior to the executive order." 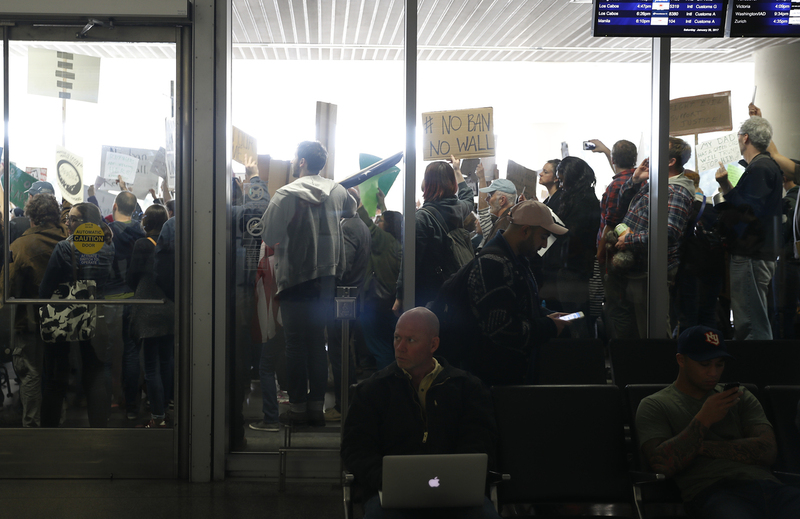 At least 63 people were detained at Dulles International Airport outside Washington, D.C. And a lot of unanswered questions linger on Sunday, according to NPR's Hansi Lo Wang. "Immigration attorneys at Dulles International Airport say they're having difficulty getting access to any detainees as granted by an order by a federal judge in Alexandria, Va.
"They say Customs and Border Protection officials are telling them detainees on site are not allowed to speak to the lawyers here. Lawyers say they are considering filing a motion saying that federal officials are not complying with the judge's order." In Seattle, lawyers "were able to spare at least two people placed on a departure flight back out of the U.S.," reports Liz Jones of member station KUOW. "But at least one refugee from Somalia was deported." Sara Assali of Allentown, Pa., told Bobby Allyn of WHYY that she had been expecting six members of her Orthodox Christian family from Damascus, Syria, on Saturday. That reunion had been 14 years in coming, Assali said, and all six had finally obtained their visas in 2015. But Assali said U.S. Customs and Border Patrol detained her family members and told them they would need to fly instead to Doha, Qatar, or risk losing green cards and visas. "We weren't expecting this because we paid everything. The green cards have been paid for, the visas have been paid for, everything has been approved," Assali said. "To suddenly be told, 'No, you no longer qualify to enter the country,' it kind of comes as a slap in the face.' 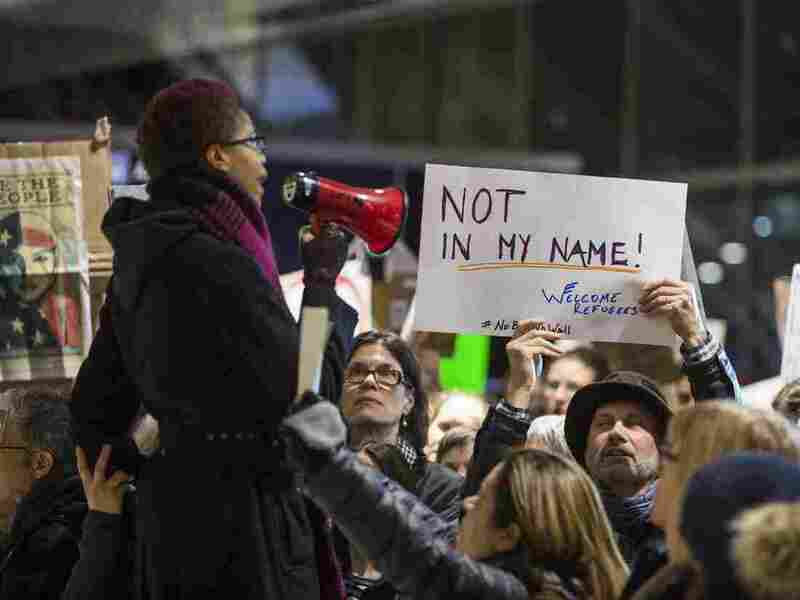 "
By the end of Saturday, protesters had gathered outside several airports and inside baggage claims to register their objection to Trump's executive order. Mayor Marty Walsh addressed the demonstrators outside Boston's Logan International Airport, asking them to "join us" and "stand with our Muslim brothers and sisters." At New York City's John F. Kennedy International Airport, where The Associated Press reports 12 refugees were detained Saturday, the protests assembled early in the day and gathered momentum by nightfall. "I never thought I'd see the day when refugees, who have fled war-torn countries in search of a better life, would be turned away at our doorstep," New York Gov. Andrew Cuomo said in a statement supporting the demonstrators. "This is not who we are, and not who we should be." The international airport in Charlotte, N.C., drew protesters on Saturday, as well. The demonstrations there grew more acrimonious than most, as six people were arrested after police and protesters "engaged in a brief skirmish," reports Nick de la Canal of member station WFAE. But the Rev. Jay McKinnon, an organizer of the Charlotte protests who spoke to de la Canal, said he would not be dissuaded from further protest. Trump is "doing what he said he would do," McKinnon said Saturday. "It's a resistance to that — to his policies, to him thinking that this is okay in our name." In his statement, Trump cited "what President Obama did in 2011 when he banned visas for refugees from Iraq for six months," in defending his own executive order — which bans refugees from all over the world for 120 days. Trump's order also bans Syrian refugees indefinitely. Republican leaders in both houses of Congress have backed up the president. "I also think it's important to remember that some of our best sources in the war against radical Islamic terrorism, are Muslims, both in this country and overseas. ... We need to be careful as we do this." On Friday, House Speaker Paul Ryan released a statement praising Trump as "right to make sure we are doing everything possible to know exactly who is entering our country." His spokesperson, AshLee Strong, also told The Washington Post, "This is not a religious test and it is not a ban on people of any religion." Trump has told the Christian Broadcasting Network that preference will be shown to Christian refugees from the Middle East, where most of the seven banned countries are located. On Sunday, he again singled out Christians from the Middle East in a tweet, saying, "Christians in the Middle-East have been executed in large numbers. We cannot allow this horror to continue!" "What do we say to the family of someone who gets killed because we didn't take these steps?" White House press secretary Sean Spicer said Sunday on This Week. "Protecting this nation and our people is the No. 1 priority of this president and our government." Reince Priebus, Trump's chief of staff, told CBS News that 109 people were detained on Saturday, "most of whom were moved out," and an additional 170 people were stopped before they could get on planes to the U.S.
Priebus appeared to offer contradictory statements on whether green card holders are affected by the executive order — first appearing to say the temporary ban does not apply to them, then walking that statement back when asked to clarify. Some GOP lawmakers sounded a more critical note than the administration, however. "It is clear from the confusion at our airports across the nation that President Trump's executive order was not properly vetted," Sens. John McCain and Lindsey Graham said in a joint statement, noting media reports that the administration consulted little or not at all with the departments of State, Defense, Justice and Homeland Security before signing the order. "Such a hasty process risks harmful results. We should not stop green-card holders from returning to the country they call home. We should not stop those who have served as interpreters for our military and diplomats from seeking refuge in the country they risked their lives to help. And we should not turn our backs on those refugees who have been shown through extensive vetting to pose no demonstrable threat to our nation, and who have suffered unspeakable horrors, most of them women and children." Trump responded to the statement by tweeting that McCain and Graham are "sadly weak on immigration." "The two Senators should focus their energies on ISIS, illegal immigration and border security instead of always looking to start World War III," Trump tweeted on Sunday. Initially, British Prime Minister Theresa May was noncommittal in her judgment of the executive order. On a diplomatic trip in Turkey on Saturday, May deferred to Trump, telling reporters only that "the United States is responsible for the United States' policy on refugees." Overnight, however, the line from 10 Downing Street drew a slightly sharper contrast. "Immigration policy in the United States is a matter for the government of the United States, just the same as immigration policy for this country should be set by our government," her office said through a spokesperson, according to The Guardian. "But we do not agree with this kind of approach and it is not one we will be taking." German Foreign Minister Sigmar Gabriel, speaking at a news conference in Paris, "questioned how such orders could be imposed by a country that embraces Christian values like the U.S.," NPR's Soraya Sarhaddi Nelson reports from Berlin. A woman uses a megaphone to address a crowd of protesters at Boston's Logan International Airport on Saturday. Still stronger rebukes came from the countries listed on Trump's immigration freeze. "President Trump is dealing with Iraq as if the U.S. had no relationship with the country," Razaq al-Haidari, a member of Iraq's parliamentary foreign affairs committee, told NPR's Alice Fordham. "When in fact the US leads an anti-ISIS coalition working to improve Iraq's armed forces and thousands of American soldiers, officials and advisers are operating there." Others in Iraq took an even harder line, Alice reports. "A spokesman of a powerful bloc of paramilitary forces says all Americans should now be banned from Iraq, and all Americans in Iraq should be deported," Alice says. In a series of tweets, Iranian Foreign Minister Javad-Zarif accused the U.S. of hypocrisy, calling the executive order "a gift to terrorists." "Collective discrimination aids terrorists," Zarif said, "by deepening fault lines exploited by extremist demagogues to swell their ranks." NPR's Peter Kenyon reports Iran is promising reciprocal action against Americans seeking Iranian visas — "but Zarif says unlike the U.S. move, it will not be retroactive, meaning U.S. passport holders with valid Iranian visas will be allowed in," Peter says. The temporary stay issued by the federal judge in Brooklyn appears to cover as many as 200 people across the country, NPR's Carrie Johnson reports. But that stay, which addresses only those who traveled to the U.S. before the immigration freeze was enacted, means only that they cannot be deported immediately. "Judge Ann Donnelly found that sending the travelers home could cause them irreparable harm to the refugees and no harm to the us government. The judge didn't make a broad ruling about the constitutional claims in the case." The Department of Homeland Security says that it intends to continue enforcing the order, and that it retains the right to revoke visas. The department "will comply with judicial orders," U.S. Customs and Border Protection said in a statement. But the statement noted that "approximately 80 million international travelers enter the United States every year. Yesterday, less than one percent of the more than 325,000 international air travelers who arrive every day were inconvenienced." As far as enforcement is concerned, Hansi says that many of the passengers and lawyers at Dulles Airport outside D.C. are taking a "wait-and-see approach" as they try to figure out the implications of the temporary stay on the ground. In the meantime, protests against the executive order were organized for Sunday in at least half a dozen cities across the country, including New York City, Houston and Washington, D.C., directly outside the White House.